Technically I haven’t started reading this one yet, but since I will today it still sort of counts right? I’m so SO excited to be finally meeting Kay Hunter and I’m having very high expectations for Scared To Death! Fingers crossed this will be another detective series to add to my favorites. This entry was posted in Book Memes, Teaser Tuesdays and tagged book memes, rachel amphlett, scared to death, teaser tuesdays by Yvo. Bookmark the permalink. I am about to start 88 North by J.F. Kirwan for the blog tour. Great teaser! I’ve just finished an audiobook of Elizabeth II Life of a Monarch. Oh that sounds like a good one! Did you enjoy it? Yes very much so, it was very interesting. 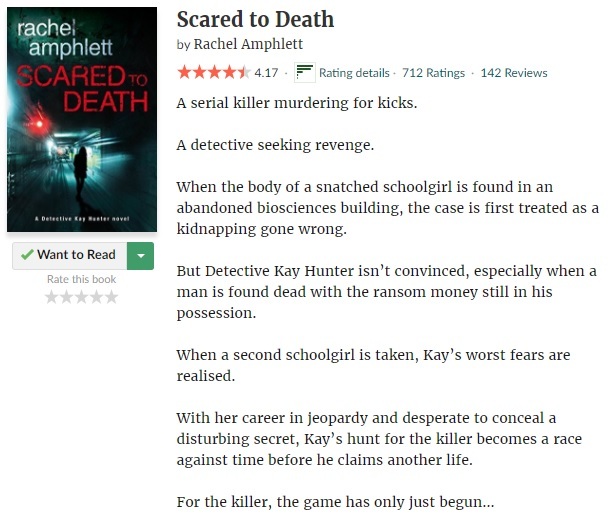 I like how the blurb claims it’s obviously a dude who’s murdering people. Could be the greatest slight of hand! So far it’s great! I’ve heard a lot of great things about the series and the reviews were totally right about it. I hope Let Me Lie was a good one! Can’t wait to get to it! And thanks!